It's been along time coming and it is finally here: Amulet Hotkey has just released the DXM-A, a PCoIP offload card for the Dell M-series blade servers. The street price should be in the $2,000 - $2,500 range. 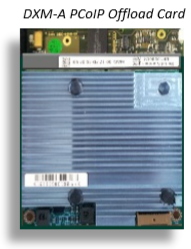 This adapter is a mezzanine card version of the PCIe Teradici Apex 2800 card which has been available for over a year and lists for $1,995, and Dell blade servers are the first to see a shipping version in this form factor. The purpose of the card is to offload the CPU overhead of processing of PCoIP, freeing up resources and providing an improved end-user experience. Use case demonstrations I have seen include medical imaging, CAD/CAM applications, streaming training videos, and even video games. Are those things typical office workers do? Maybe, maybe not, but being able to offload graphics processing has the natural side effect of making more CPU clock cycles available for user desktops and applications and/or allowing greater consolidation ratios. Using the adapter requires installing a kernel module, an in-guest driver, and enabling the feature within the VMware View administration console. Having installed Dell M620 blade servers in the data center for server virtualization, I have been waiting for this card to become available as I had set aside blade slots for VMware VDI hosts and wanted the option to employ PCoIP offload if needed. While I could have moved ahead without these I might have had to purchase additional blade servers in order to help ensure an optimal user experience, or go with rack mount servers in order to gain the needed standard form factor PCIe slots. Moving to rack mount hosts however would require a much larger number of 10 Gb switch ports than I had planned for, and I wanted to leverage the available blade slots and continue to reap the savings that are the result of economies of scale when implementing many blades (same chassis, same blade switches, same storage switches, standardized hardware, firmware, power, etc.). 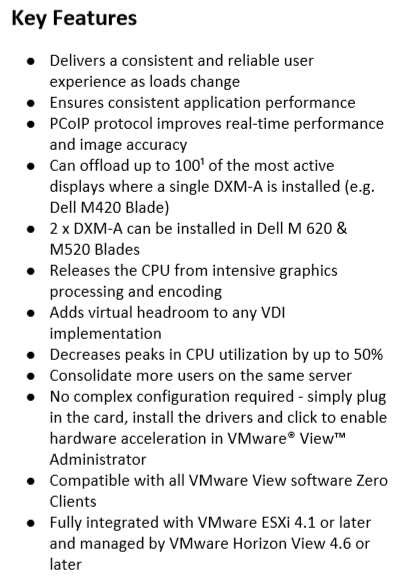 Because these offload cards can reduce per-VM CPU utilization by as much as 50% while ensuring a consistent user experience one might argue that they should be included in any VDI solution utilizing Dell blade servers (as they are currently only available for the G12 M-series today). Until now you were limited into using a rack mount server form factor in order to use the Teradici Apex 2800 PCIe adapter, though that also meant that you could use servers from any manufacturer. GPU offload is not yet an option on Dell blades so this offload is the best alternative. If GPUs ever do become available the two technologies will be complementary, according to Teradici. Does every VDI implementation need these cards in order to help ensure success? No, not all of them, but remember that users do not really want a desktop that is less functional than what they already have, despite what some resellers might tell you. Selling such a desktop requires strong executive sponsorship and leadership, and will likely result in unhappy users. In the end it's a business decision but don't forget that user experience should factor into the decision. Lack of user acceptance is cause for failure. Some other factors to think about include your particular applications and use cases, whether multiple users per host will be simultaneously handling intense graphics or streaming media, the number of virtual desktops per host, the type, speed, and number of CPU cores per host - and capacity margin, memory allocations, and more. Being able to reduce CPU requirements can also provide you with greater CPU selection options as well. Where you might have previously picked a "faster" processor with a higher power requirement but which in turn gave you a smaller cache and which limited the number of memory slots that you could use, you might now be able to pick a slightly lower speed processor but with more cores, a larger cache size, a lower power requirement, and the option to populate all of the memory slots (more RAM per host). In any case if you are using Dell blade servers it is nice to now have the option without making the trade-off of not being able to offload the graphics protocol. I myself am considering using these cards for use in an upcoming VDI design in order to help provide the best user experience possible while reducing CPU utilization. One may be tempted to think that their "standard office environment" does not dictate the use of a PCoIP offload adapter, however it is not always easy to classify worker types, and VDI assessments often fail to discover every single use case. What may be seen as an "easy" task worker desktop environment may not be so easy if it turns out that employees periodically stream video to their desktop for training purposes. There are the other VDI design considerations of course, but this is an important piece of the puzzle in a complete solution. Perhaps Teradici or Amulet will be willing to allow me to test a unit beforehand. If you have not yet seen a demonstration of the Teradici Apex 2800 offload card take a look at a video from VMworld 2012, and on their website. Have you used this card yet? If so I would be interested in hearing your feedback based on real-world implementations.